Every time you travel for longer distances in Norway, you get to experience great nature. This has come to the attention of visitors as well, and the last couple of years “travel like locals”-itineraries provided by local public transport-companies has become a popular alternative where they are on offer. On Sunnmøre, for example, thousands of travellers have explored the fjords and mountainsides in the area from the bus seat. The Norwegian long distance trains have a lot to offer as well, and some routes has become national icons for the Norwegians, like Bergensbanen and Nordlandsbanen. 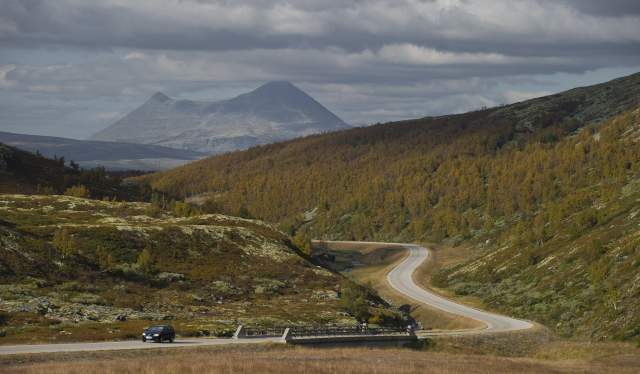 In the hilly landscape of Norway, with mountains, fjords and large swathes of forest it is only natural that a journey from A to B can be just as interesting as the destination. Here are some suggestions for fantastic trips, where visitors and locals sit side by side enjoying the view. Anyone who travels in the western part of Norway quickly learns to take the timetables of ferries into account. Even relatively short trips will include crossing of fjords, and even though this is done on hourly ferries that is part of the locals’ daily life, several of the crossings are attractions in and of themselves. To help visitors get more out of the public transport system in the area, the local public transport company, Fram, has developed a set of itineraries with suggestions for good ways to travel by bus and ferries to discover Sunnmøres many amazing nature experiences from the seat of the bus – as well as ferries. One of several suggestions is the round-trip from Ålesund to Stranda. Here, the bus will take you through idyllic views on the way to Stranda, where you during winter can ski from the top of the mountain all the way down to the shore of the fjord. On the way home you cross over to Liabygda by ferry and travel by bus along the beautiful Storfjorden on your way back to Ålesund. 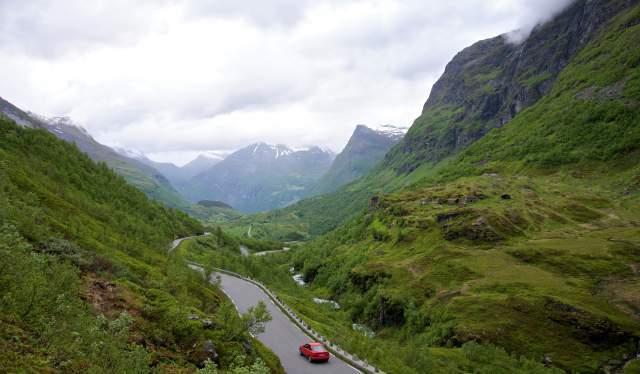 There are also suggestions for trips that starts from most of the big cities on Sunnmøre along the unique and famous Atlanterhavsveien (The Atlantic Road), which has been described as the world’s most beautiful car trip. A great point of pride of the inhabitants of Oslo is Oslomarka. There aren’t many capitals in Europe that can match having such a large area of raw and wild woodlands so close to the city. During the winter the t-bane-trains (subway-trains) are usually packed with locals with skis in their hands. The same rides are a great way for visitors to easily and quickly head into nature from Oslo. Some of the lines even offer great nature on the way. 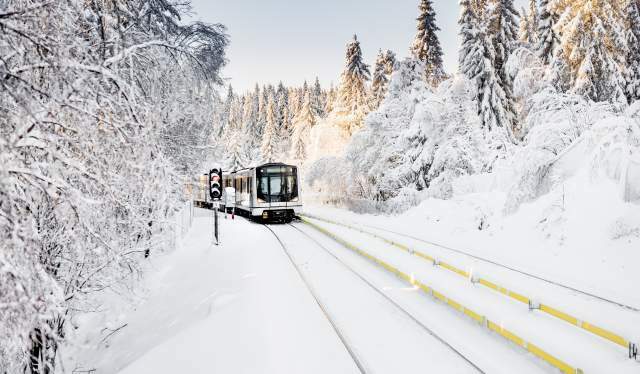 Take for example line 1 to Frognerseteren, where you can experience nice views of Oslo on the way up to the end station, which lies 469 meters above sea level. Bergensbanen (The Bergen Railway) has been the link between the western and eastern part of Norway for over a century. What started as an important project for transport – which cost an entire state budget at the time it was built – has today become one of the most famous and popular train rides in the world. The journey takes about seven hours, and along the way you will travel from urban environments in Oslo through a highlight reel of Norwegian nature: through barren mountain plateaus, forested valleys and beautiful fjords. Norwegians are so fond of Bergensbanen that when the public broadcaster chose to send the TV-program Bergensbanen minute for minute – which places a camera in the front of the train and lets viewers come along for the entire seven hour journey from their homes – over a million Norwegians watched the show at one point. The entire seven hour program had over a hundred thousand viewers on average through the entire thing. In other words, Bergensbanen is an attraction in and of itself, even though you’ll be sharing a seat with regular travellers who may be on their way home for the weekend. 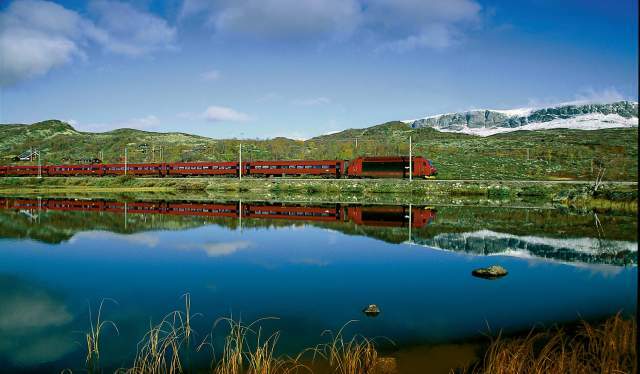 Bergensbanen isn’t the only train ride in Norway where nature is an attraction by itself. 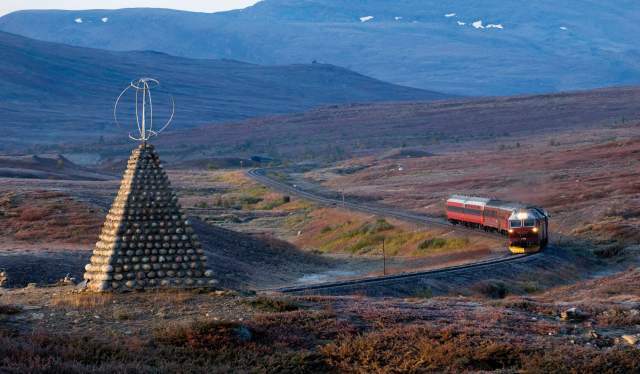 Nordlandsbanen (The Nordland Railway), which extends from Trondheim to Bodø, isn’t just the longest of its kind in Norway, it is also one of few train rides in the world that lets you cross the polar circle. Just like Bergensbanen, Nordlandsbanen treats you to several great views of Norwegian nature in quick succession when you travel from the forested areas and inland villages in Trøndelag via coastal areas and highlands into the wild, northern nature of Northern Norway in and around the polar circle. The first part of Nordlandsbanen has been open since 1881 and has captivated travellers ever since. It has even had its own TV show as well, which was seen by more than one million Norwegians. Though not as famous as the beloved train rides, the bus routes that cross different parts of the country is a great way to experience Norwegian nature as well. Take for instance Fjordekspressen: on the journey between Bergen and Trondheim you get to view big waterfalls, fjords and mountains, not to mention small villages and green glacial river water in the river that runs through Otta. The rides can be long – the full trip on Fjordekspressen is 14 hours long – but in return you really get to see what Norway has on offer, from the mountainous landscape of Dovre National Park to idyllic coastal societies, calm villages and dramatic fjords with waterfalls and mountains that stoop down into the water.